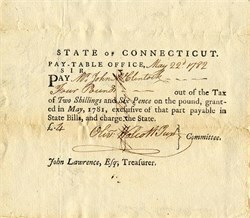 Histroy Pay Table Draft from the State of Connecticut Pay-Table Office issued in 1782. This item was signed by Oliver Wolcott Jr. as a committee member and is over 225 years old. Oliver Wolcott Jr. (January 11, 1760 � June 1, 1833) was United States Secretary of the Treasury from 1795 to 1800 and governor of Connecticut from 1817 to 1827. He was Born in Litchfield, Connecticut, son of Oliver Wolcott, he graduated from Yale University in 1778, later studying law at Litchfield Law School and being admitted to the bar in 1781. Wolcott was appointed in 1784 as one of the commissioners to mediate claims between the U.S. and the state of Connecticut. After serving as state comptroller of Connecticut from 1788-90, he was named auditor of the federal treasury, and became comptroller of the Treasury in 1791. He was appointed Secretary of the Treasury by George Washington in 1795 to succeed Alexander Hamilton, but resigned in 1800 due to unpopularity, and a particularly vitriolic campaign against him in the press in which, among other things, he was falsely accused of setting fire to the State Department building. 1799 as Secretary of the Treasury he designed the United States Civil Flag. From 1803 to 1815 he operated in private business in New York City, afterwards retiring to Litchfield. He was elected governor in 1817 as a "Toleration Republican", following in the footsteps of his father and grandfather, and serving ten years in the post. His tenure was noted for the economic growth and moderate policies that attended it. Additionally, he presided over a convention that created a new state constitution in 1818. Wolcott died in New York City and is interred at East Cemetery in Litchfield. Prior to his death, Wolcott had been the last surviving member of the Washington Cabinet.